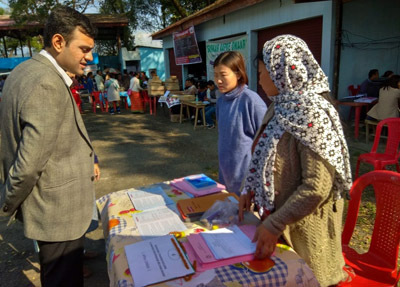 KARSINGSA, Dec 28: Capital Complex Deputy Commissioner Prince Dhawan launched the offline version of e-ILP for Banderdewa check gate during the Sarkar Aapke Dwar (SAD) camp held here in Papum Pare district on Friday. “The offline version has been developed by the IT & communication department in view of the connectivity issues in the border areas,” Dhawan said. The offline e-ILP has the provision to be synced with the online inner-line portal. The DC said a counter has been set up at Banderdewa to issue e-ILPs to visitors instantly on their arrival, at a minimal charge of Rs 100 per head. In order to promote cashless transaction, the counter will be enabled with a point-of-sale machine in due course, Dhawan said. Visitors are required to produce their original ID proof along with the inner-line pass at the check gates during verification. Among others, State Council for IT & eGovernance Director Neelam Yapin Tana, e-ILP state nodal officer Techi Tado and Banderdewa CO Jumir Ronya Kato were present on the occasion. Meanwhile, Nampong MLA Laisam Simai inaugurated the SAD camp organised by the Changlang district administration at remote Lungpang village on Friday. The MLA, who was accompanied by Jairampur ADC SS Choudhury, urged the villagers to take full advantage of the services provided at their doorsteps through various departments.